Research to be published today tells a very different story. Campaigners trawled through oil companies’ estimates for how much oil or gas is under their respective blocks of Ireland’s vast seabed. The intriguing result is a map showing Ireland surrounded by 69 prospects, discoveries and other licensed areas. The combined total estimated to be in these areas – according to the relevant companies’ own geologists – is a staggering 21 billion barrels of oil equivalent. Obviously this figure comes with disclaimers: exploration companies do talk up their prospects to attract investors; and it is generally not possible to extract all of the reserves in a given field. (On the other hand, the figure is conservative insofar as it only includes areas for which estimates have been provided.) But this research tells us something important: that while oil companies have been telling us our waters could well have nothing to offer and that Pat Rabbitte had better keep giving out licences on the old terms, they have been saying something very different to shareholders and investors: namely that there are huge quantities of oil and gas here and they confidently expect to laugh all the way to the bank. The research is contained in ‘Liquid Assets’, a report to be released today by the Shell to Sea campaign. The report debunks numerous myths used to defend our giveaway terms, for example the idea that more discoveries will create a thriving industry here and give us our own supply of oil and gas. The reality is that the companies don’t plan to bring the resources ashore here. In fact, almost no benefits are guaranteed under our current regime. 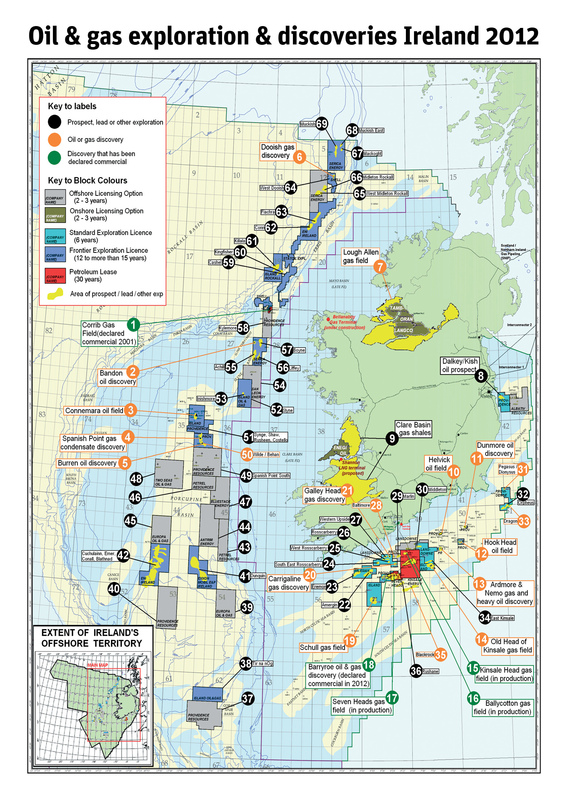 Let’s look at the Barryroe field as an example of what oil and gas discoveries will mean for the Irish economy. Providence Resources announced in July that Barryroe, 50km off Cork, contains up to 1.6 billion barrels of oil. The company will own every drop it extracts, paying no royalties to the State. Not only that, Ireland has no say over what happens to the oil. Providence can choose to export directly from the rig to a refinery overseas: there is no obligation to bring it ashore in Ireland or use Irish services or personnel. Crew on rigs are flown in from overseas. In the case of its Dalkey Prospect (estimate: 870 million barrels), Providence plans to export directly from the field. It has not yet confirmed where oil from Barryroe will go. So, as well as having no guarantee of economic spin-offs, Ireland also has no guarantee of a domestic supply. And if Providence does choose to bring the oil ashore here, it will sell to Irish consumers at the current market rate. In other words, having oil or gas under our waters will not protect us against international price rises. Our oil fields might as well be off the coast of Brazil. The only guaranteed return to the Irish exchequer is a tax on profits of 25% (in exceptional cases, where a field is highly profitable, a further post-tax levy of up to 15% may apply). The State will not receive a guaranteed share of revenue: this is the crux of the problem. For the purposes of tax, when Providence is calculating the profits from Barryroe, it can avail of extremely liberal tax write-offs. Incredibly, it can write off the cost of all its exploration activity anywhere in Irish waters in the previous 25 years. I discovered the existence of a 2003 consultants’ study for Shell that reveals just how small the State’s share is likely to be: it projected that the Corrib project would pay just €340 million in tax over its lifetime, or roughly 7% of total field revenue. That’s the tax return from what “profits” would be left after Shell’s accountants had availed of the tax breaks written into the terms by Ray Burke 25 years ago. Pat Rabbitte argues that low revenue is better than no revenue: if giving it away with minimal returns is the only way to get at it, then give it away we must. This is short-sighted nonsense, a mentality born of the same pro-corporate, light regulation approach that caused our economic crisis. The fact is that allowing companies to extract our oil and gas involves great costs. The most obvious costs are environmental: a spill at the Dalkey Prospect could reach the shores of Dublin in one hour, according to the company’s Oil Spill Contingency Plan. Then there are the social costs, as witnessed by those resisting Shell in north Mayo. The environmental and social cost of fracking, if it is allowed in Ireland, can barely be imagined. But there is also an economic cost: extraction means the depletion of resources that would be vital in decades to come, when security of supply is a real issue (currently there is no threat to our security of supply, that’s another industry myth). The starting point for this debate should be: why should we extract these resources at all? Considering the various costs associated with extraction, if Ireland is to allow private companies remove our valuable assets, the Government needs to be able to point to significant benefits to Ireland in order to justify that extraction. Under our current terms, it cannot. This entry was posted in Ireland's management of its oil and gas, Security of supply, State 'take' and tagged Barryroe, Barryroe oil field, Irish natural resources, Irish oil and gas giveaway, Pat Rabbitte, security of supply, Shell to sea. Bookmark the permalink. So our country is being dug up, our people are being put in danger and our country is being ruined for what exactly 7% of the profit. Sorry but I think our country and its people are worth a lot more than that and it’s about time things started to change!